Turnbull Manufacturing Company in Bloomfield, NY is pleased to announce a run of ten Buntline Single Action Army Revolvers available in either 45 Colt or 44 Special. This limited time offer of Buntlines will include Turnbull’s famous color case hardening on the frame, loading gate and hammer with the balance of the firearm charcoal blued. To personalize this offer, customers can choose their barrel length (up to 16”) and three initials to be engraved on the back strap. 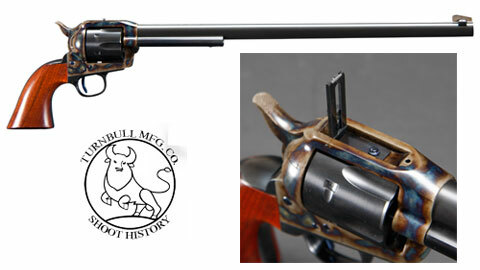 The unique ladder sight on this revolver is only available from Turnbull Manufacturing Company. Priced at $1,650.00. Turnbull Manufacturing Company is dedicated to the faithful and accurate restoration of vintage firearms. Over the past decade, they have expanded their business to include their own line of Colt-style single action revolvers and Winchester-style rifles as well as offering upgrades to modern and original guns. Fore more information, visit www.turnbullmfg.com.